Is true discipleship dead? Over 2000 years ago, as Jesus prepared to leave earth, He left us a blueprint for making disciples. A disciple is a follower, learner, and one who adheres to the teaching of their Master as the basis of their conduct. A true disciple learns the principles of how to be a follower of Jesus Christ, then takes that knowledge and puts it into action. The gospel. In 1 Corinthians 15:3–5, Paul communicates the simplicity of the gospel to us. Jesus died for our sins according to the Scriptures, He was buried, and on the third day, He was raised from the dead according the Scriptures. Jesus then appeared to many including the disciples and Paul. The power is in the gospel (Romans 1:16–17). The work of the Holy Spirit. No man comes to God unless God draws him (John 6:44). A person’s heart must be softened to the gospel to realize they need a Saviour. When a new disciple has repented of their sins and died to themselves, Jesus tells us that baptism is a required part of discipleship. The process of repentance is often an intimate moment between a person and God, but baptism becomes the public confession of inward change. “That’s it. We now have a disciple of Jesus, and the job is done.” Right? This is where the struggle begins in our churches today. When we have new disciples, we send them off to the Scriptures by encouraging them to read the Bible every day. We tell them to use a reading plan; start in John, Romans, or just go book by book starting in Genesis. This often leads new disciples to discouragement, as some feel overwhelming guilt if they fail to read the Bible every day, if they don’t understand what the Scriptures are telling them, or don’t apply those truths accurately. Jesus tells us in Matthew 28:20, “teach them to observe.” This is the picture of Jesus with His disciples. Take the word of God and walk through the Scriptures together, observe, interpret, apply. This is true discipleship from God’s Word. How are we doing with this? I’m currently crossing the country with our Doulos Cross-Canada Tour. Our trainers have been training and teaching these truths to participants, equipping them to disciple others using our 40-Minute Bible Studies. A few weeks ago, we were in danger of not having this trip due to very low attendance numbers, which was a great concern considering the topic and desperate need for God’s Word in this country. God prevailed, and numbers have increased, and God is at work. In Halifax, we had a full classroom. In Mississauga, we had to send two trainers to meet the need. And we’ll close out this tour with a packed classroom in Kamloops, BC. Our message in this training is very clear: There’s a call, cost, and commitment to be a disciple. 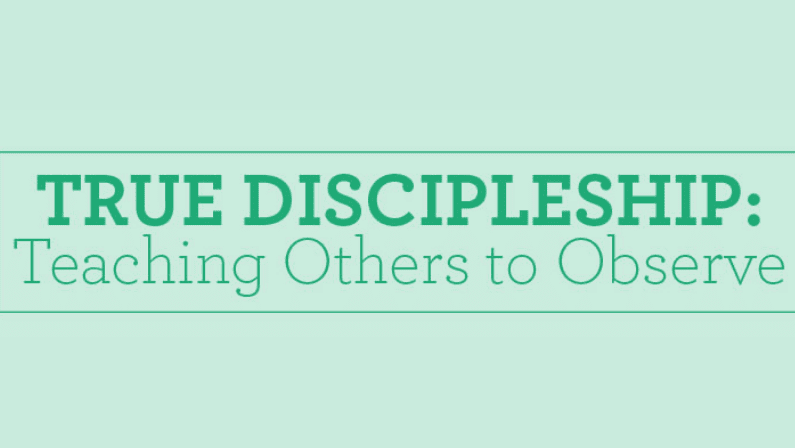 Join us in the discipleship mission! True discipleship is the focus of our ministry. Our mission is to establish people in God’s Word, and we believe that people are established in God’s Word when they study with others. Disciple another person in God’s Word using one of our valuable tools. The 40-minute, no-homework study is a great starting place. Join our E-Team and be a regular financial partner and prayer supporter. You’ll receive monthly prayer updates and up-to-date news on what God is doing in Canada. Give a financial gift to further the mission of Precept in Canada. Your one-time gift will be used to make disciples, start new classes, and open new training opportunities across Canada. Pray for Precept Ministries in Canada. We’re at war in this world. Discipleship is not dead, but it’s under attack, and we need God to intervene and open more opportunities for training. Thank you for supporting the ministry in all you do. Join us today in our mission, and be a part of meeting the growing need to equip God’s people to study the Word with the inductive study method.